Mike Judge will never be confused with Woody Allen. However, each shares an affinity for satirical comedy drawn from the nuances of their respective habitats. For Allen, his voluminous filmography is usually set in America’s artistic epicenter, New York City, a fact that has also undoubtedly afforded Allen much critical leeway. Whereas Allen wallows in the Upper East Side, Judge lives in the lower west side: Texas, in the workaday malaise of the American heartland. In contrast to the prolific Woodster, Judge’s sparse resume is a product of his renowned, sometimes inhibiting perfectionism. The creator of Beavis & Butthead and King of the Hill has directed only three live-action feature films; one of those, the star-crossed Idiocracy, is seen by some as Judge’s attempt to revisit Allen’s Sleeper. In Extract, Judge’s talent for toeing the line of caricature without stooping to condescension is again on display. The film’s sardonic look at the workplace milieu immediately recalls Judge’s cult fave, Office Space. 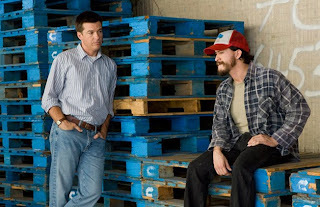 Jason Bateman plays Joel Reynold, the owner of a flavored extract factory beset by professional and personal woes. Joel yearns to sell his company and cash out for an early retirement, but a proposed deal with General Mills is threatened when an employee (Clifton Collins Jr.) sues after losing a gonad during a workplace accident. At home, Joel is trapped in a sexless marriage, always arriving home just beyond the eight o’clock deadline after which his frosty wife, Suzie (Kristen Wiig), cinches up her sweatpants for the evening and settles in to watch Dancing with the Stars. Joel whiles away his nights at the local watering hole, where Dean (Ben Affleck) serves up drinks, half-baked-if-well-meaning advice, and assorted pharmacological remedies. Within this inanity, there is a grifter named Cindy (Mila Kunis), who is looking to drain whichever poor sap into whom she can sink her comely claws. And, there’s a lunkheaded gigolo named Brad (Dustin Milligan) who takes his charge of seducing Suzie way too enthusiastically. Bateman proves a worthy foil for scene-stealers Affleck, Koechner, and Gene Simmons (yep, that Gene Simmons) as a slimy, ambulance-chasing lawyer with the suitably reptilian name Joe Adler. However, the talents of Kunis and Wiig are underused, while Collins, J.K. Simmons, and the rest of the supporting cast fill flat, one-note characters. Allusions to America’s eroding manufacturing base, attitudes toward Hispanic laborers, and the tenuous institution of marriage free-float throughout Judge’s screenplay. Still, too much significance need not be assigned to the genial, sometimes sketchy humor. There’s enough social commentary simply in our recognition of the cliques that drive the assembly-line setting, or the annoying, nosey neighbor (David Koechner) who seems to always flag Joel down just as he arrives home from work, never stops talking, and pesters him to accompany he and his wife to a local Rotary dinner with $55 tickets Joel will have to buy. More intriguingly, while Extract revolves around a white-collar lead who drives a Beemer and lives in a gated community, he represented as ultimately more dysfunctional than the redneck who swills Pepsi out of a 2-litter bottle while watching The American Outdoorsman on his giant rear-projection TV. With this film, Mike Judge comes off as a working man’s Woody Allen … or a kindler, gentler Judd Apatow. Too bad he doesn’t make nearly as many movies. Loved the Teen Wolf reference. Glad to see Bateman has shaken off his "Silver Spoon" days. Great review as aways!